We had reported earlier how China was one of the countries responsible for large amounts of debris around the outer earth orbit which could harm other satellites and space travelers. Russia has announced last week that it will spend nearly $2 billion in a massive clean-up program which will remove debris that is orbiting earth. The Rocket and Space Corporation of Russia, Energia announced that it will be launching and will over see the spending of almost $1.9 billion on sending an orbital pod that will sweep up broken pieces from satellites and other junk that is circling the earth. The orbital clean up pod will take almost ten years to construct and is to be tested between 2020 and 2023. 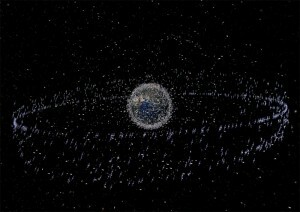 The pod is estimated to take another ten years to clean up the trash which also includes almost 600 defunct satellites. The nuclear-powered pod will have a life of around 15 years which Russian scientists say is enough time for the pod to clean up the earth’s outer orbit. Russia is also actively working on a project called “space interceptor” which is to destroy dangerous objects headed towards earth such as asteroids and comets. Competition Winner to be sent to Space! Next A SuperComputer the Size of a Sugar Cube! Of course, other countries will happily watch as Russia creates a device capable of intercepting and destroy other space objects, because they are completely sure it will only be used for these trash-eliminating purposes.